Rarely do I travel to Orange County – willingly, that is – for anything other than family-related events or weddings. I know – I said “travel.” It’s just so far. But when I got invited to a Northern Vietnamese food tour, my interest was piqued. Where else to learn about Vietnamese food than in the largest and highest density of congregate Vietnamese outside of Vietnam? We started out at Lee’s Sandwiches with a refreshing, sweet coffee and of course a bÃ¡nh mÃ¬ to start. It was a good, spicy sandwich and left my lips burning afterwards! What I like most about bÃ¡nh mÃ¬ is the combination of daikon and pickled carrots. But there was just the right amount of sweetness in this sandwich and it was easy to bite. Then we went to the produce section. We learned all about mint, tumeric, basil, ginger and other herbs used in Vietnamese cooking. Afterwards, we learned about the three types of noodles in Vietnamese cooking (dried, fresh, intermediate). 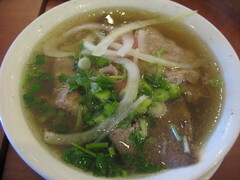 The latter is the banh pho that one would find in a Vietnamese pho noodle soup, which is ready to eat almost after being immersed in hot broth and without too much additional cooking. 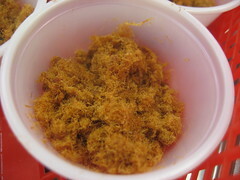 Bun is a round rice noodle while Banh hÃ³i is the thinnest, almost like an angel hair – but even thinner. We also got the lowdown on sauces, cooking wines and oils. It was interesting to learn about certain Vietnamese words, such as Nhi, or “best quality,” and KhÃ´, an indicator for sweet soy stews. We also learned about the differences in condensed milk (used in Vietnamese or Thai coffee) and how “filled” milk is supplanted with oils instead of cream. Avoid! The next stop in our tour was a tofu “factory” and supply – called ÄÃ´ng PhÆ°Æ¡ng Tofu. There, we got to experience all the differentÂ forms tofu can come in.Â I’ve been eating tofu all my life; however, I did not know that a common coagulant isÂ used in tofu – gypsum. At our final stop at a pho noodle place nearby, we got a good taste of 3 different dishes. I thought the Shaking Beef – the recipe for which is in Chef Danhi’s James Beard Award-nominated cookbook (!) 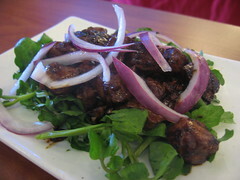 – was refreshing with all its fresh herbs commonly used in Vietnamese cooking. The broth in the pho was really well done and exceptionally tasty. 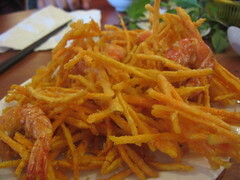 But the treat – as fried seafood many times is – was the fried prawn cake. The Little Saigon Tour wasn’t a glutton fest. Instead, it wasÂ beyond educational and I appreciated learning basic Vietnamese root words, the patterns in their cookingÂ and could relate it to whatever else I knew about Asian and Southeast Asian cooking in general. What a treat. 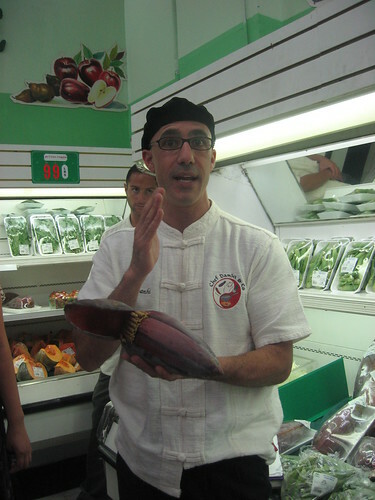 The next Northern Vietnamese/Little Saigon Tour is this Saturday, September 19. I hear there are a few spots open so be sure to sign up! 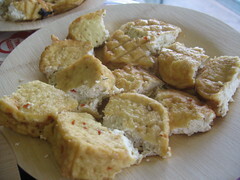 This entry was posted in Events, Orange County and tagged Chef Danhi, cooking, Dong Huong Supermarket, Dong Phuong Tofu, Garden Grove, Lee's Sandwiches, Little Saigon, Northern Vietnamese, tours, Westminster. Bookmark the permalink.